The Water Environment Federation (WEF; Alexandria, Va.) Disinfection and Public Health Committee seeks input from water sector professionals on their current disinfection practices. Results from an online survey will update information collected in previous surveys sent in 1979, 1989, and 1996 about the design, operation, and performance of disinfection facilities. Participant names and information provided will be kept confidential and only reported as aggregated data. 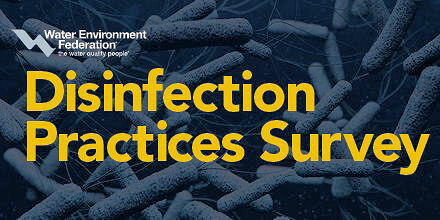 Download and complete the Disinfection Survey Costs Worksheet before participating. Complete the online survey by Jan. 31. For more information, contact WEF staff member Beth Conway at econway@wef.org.